On February 01 when Zhou Xun finished shooting the movie "Painted Skin", we prepared to returned to Beijing from film studio Hendian, Hangzhou. Unluckily, we encountered heavy snow, the airport was closed so we had to stay in Hangzhou. On February 02, in the early morning, opening the window, we saw that it was snowing heavily. Turning on television, all channels took reports about the damages of snow storm. Thinking of up coming Spring Festival, we wondered how many people couldn't go home on these special holidays. At 3 p.m, snow finally stopped. Through a special program, we knew that every department in Hangzhou paid all attention to sweeping snow away and protecting trees. Xiao Xun suggested that we should go down street and sweep snow but we had some different opinions. 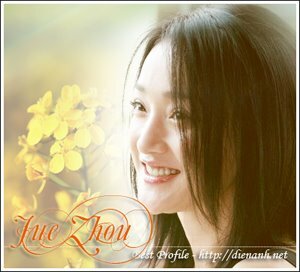 We worried that as a famous person, if Xiao Zhou appeared in the street now, there would be surrounds but she gave proposition ignoring that. 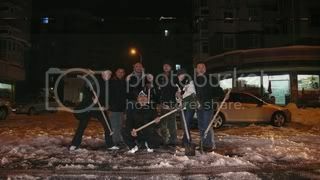 After dinner, there were some Hangzhou people, polices and soldiers together plowing snow on Xihu river's branch. Xiao Xun thought that if they didn't sweep snow just because of 2 reasons: lazy and lacking of sincere and finally she persuaded us to join this public activity. Snow was very thick. It took us a while to sweep 10-ten-meter raod and they worked more and more zealously. Xiao Xun excited said that :"For me, two days stranded in Hangzhou were really happy and the most significant time". We also had the same deep feeling. After more than one hour, a snow-plough came. All of us were surprised at its power. Xiao Xun bought hot drink and food from near store. We helped her to work all night together with the big machine. We also took a photo with a spouse in the near street. Maybe all people worked hard and it was dark so nobody recognized Xiao Xun. 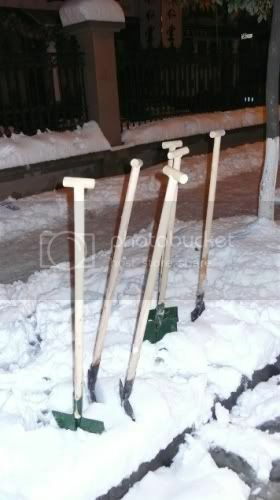 Perhaps plowing snow was an exercises that made us very hungry at night and ready to take a midnight snack. As a result, coming back hotel, we couldn't sleep. On February 03, there was not any flight. Luckily, in the same evening, Hangzhou report reopened, we finally returned to Beijing. Then Xiao Xun sent a telegram to Brother Hua Yi to contribute 10,000 Yuan to help reduce snow disaster.